Young people’s political awakening has swarmed up as a major issue of public debate once again. First there was the return of mass a student protest movement, as young people mobilised against the budget cuts. And then the riots this summer in English cities prompted a mass debate about youth as depoliticised and disenfranchised. Among all this discussion music has come up repeatedly; whether that’s NME lamenting the lack of a soundtrack to the student protests or political pundits blaming rap music for the riots. So it seems an apt time for artists to consider that shattering moment in a young person’s life of political awakening. But to do so, artist Katie Hare in a multimedia installation in The Old Police Station in London, will return to a key moment in young women’s activist history, 1993, to consider Heavens to Betsy’s album Calculated, which takes as its subject Corin Tucker’s own ‘click’ moment of politicisation. The installation, which runs from 14-16 October, and includes video, audio and zines inspired by this important album from the history of riot grrrl, is part of The Rupture Series. This series of exhibition and events seek to explore “the processes by which art may appear to ‘rupture the ownership of space'”. “The opening and the development of this series over the course of 2011 comes as frustration felt amongst many young people about the seemingly insignificant power of the individual reaches boiling point. Responding to a media blitz casting young adults as the ‘lost generation’, The Rupture Series looks at artists who are trying to engage and disturb the ideological complicities and unconscious practices of the individual. The series opened on 29 July with ‘Hunter/Gatherer: Last position received’; an intercepted transmission of a fictional sea crew on a search for enlightenment, whose journey goes astray. 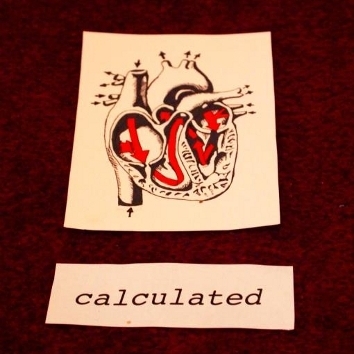 It continues on 14 October with ‘Calculated’, a sound and video installation by Katie Hare, who graduated from Saint Martins College of Art in 2010, which is based around Heavens to Betsy’s 1993 album Calculated. A duo comprised of Corin Tucker and Tracy Sawyer, Heavens to Betsy formed in Olympia, Washington in 1991. Closely connected with riot grrrl, the band recorded a number of singles and tracks for compilations, but Calculated was their only album. Tucker went on to form Sleater-Kinney following the demise of Heavens to Betsy, and is now embarked on a solo career (her debut solo album was released last year) but her first band still excites passionate interest. For Hare, the appeal of Calculated was its “honesty and directness. The liner notes, written by Corin Tucker, explain the reason she wrote the song ‘White Girl’, and how racism within the punk community and within ‘ourselves’ needs to be addressed and it’s referred to on a couple of the other tracks. She “found out about Riot Grrrl through Kurt Cobain. I was totally obsessed with Nirvana in my early teens and would try and listen to any bands that they name checked in interviews or on their t-shirts, which is something I really love about Nirvana – they really turned a lot of people on to loads of really cool music. So I probably discovered Riot Grrrl in a totally sensationalised way at first, as a biography of Kurt Cobain (Heavier than Heaven) came out when I was 13 and I remember an extract appeared in a magazine focusing on his relationship with Tobi Vail. She adds, “I’m hoping we can get quite a diverse audience for this event, and I’d be really interested to see how different people react. I’m excited about this project as I think it kind of jars and this is going to sound like such a terrible cliché, with the vibe of the art world, in that it’s very earnest and kind of uncool. “Earnestness isn’t very fashionable. I think there’s been a bit of backlash, especially amongst my generation, speaking as someone who went to art school in London, against very personal work, or really spilling your guts and everything seems to have become more detached. In a way I quite want to make people feel embarrassed or uncomfortable by the album and zine, as it’s so personal and unselfconscious.